As usual, Monday has come round all too quick. We are back with another party and your hostess with the mostest this week is All you need is love and cake. Come and take a look at what is going on, and I can guarantee that you will find some great activities and advice. That’s not too hard I hope. However, if you are struggling, please do send me an email , or tweet me and I will do my best to help you out. 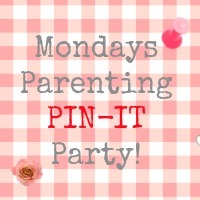 Do you all need a reminder of the Parenting Pin it Party board – if so, here you go! Right, now that is all done and dusted – here you go! This is super cool! I know that my toddler and preschooler will enjoy this.